State senators and representatives from either side of the Longfellow Bridge want the state to keep the "flex posts" that separate the Longfellow bike lanes from cars over the winter. Read more. What's old is new: Myron Freeman took in the new lights on the rebuilt Longfellow Bridge yesterday (see it from the other side). Brad Kelly, meanwhile drove into the spidery arms of the Zakim Bridge recently: Read more. 617 Images took in the renovated Longfellow Bridge in the early morning fog. Jason the roving UHub photographer, meanwhile, got a good look at the Back Bay in the fog from the turnpike around 8:30 a.m.: Read more. 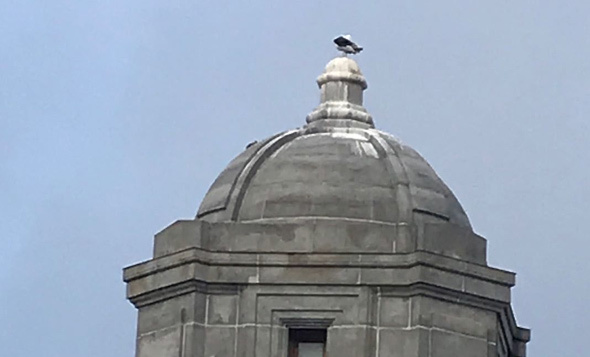 Lovely seagull poop on all 4 towers of the beautiful Longfellow bridge. Boston Police report arresting a Quincy man after they say an officer watched him spray graffiti on two sections of the Grand Junction railroad bridge - and say he's also wanted for defacing the Longfellow Bridge. Read more. The body of a 59-year-old Boston man was recovered from the Charles River near the Longfellow Bridge this morning, the Suffolk County District Attorney's office reports. Read more. The Cambridge Historical Commission shows us what the new Longfellow Bridge looked like in 1908 - a couple years after it opened - as the Cambridge Bridge. Look at those gasometers in Kendall Square on the Cambridge side. Read more. MassDOT reported tonight that all lanes on the Longfellow Bridge will be open for business tomorrow. Read more. John Hawkinson spotted a flatbed carrying a flatbed on the Longfellow Bridge yesterday. City Councilors Michelle Wu (at large) and Josh Zakim (Beacon Hill, Back Bay, Fenway, Mission Hill) will ask other councilors to join them tomorrow in urging the state to use barriers to protect bicyclists when the revamped Longfellow Bridge finally opens later this month. Read more. Owen peered into the abyss from the Cambridge side of the Charles River shortly after noon. Due to ongoing track work from Longfellow Bridge Project, trains will use reduced speeds between Kendall/MIT & Charles/MGH until further notice. They're busing Red Line riders between Park Street and Kendall Square today because Longfellow. And naturally, they've hired private coach buses rather than use T buses, so that means riders get comfy seats and, as Adam Castiglioni shows us, NFL football. Amy Bucher didn't realize she'd need a hard hat to walk under the Longfellow this afternoon. Around 2 p.m., Patrick McMahon looked out and discovered he could no longer see the Longfellow Bridge, about 900 feet away. WBUR chronicles all the issues, including the fact that the bridge is a historic landmark right down to its rivets, which means contractors have to use historic methods to rebuild it, right down to the use of 50,000 historically accurate rivets, rather than more modern, and faster ways to connect metal support beams. Traffic will be briefly halted near Charles Circle Saturday morning as crews working on the Longfellow Bridge start would could be a two-day project to clean out a steam pipe that runs across the bridge. Traffic will resume once the steam venting starts up, shortly after 7 a.m., Cambridge Police say, adding: Read more. 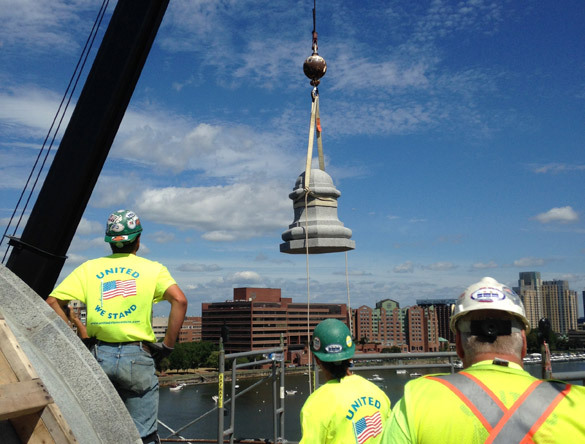 MassDOT reports construction workers finished topping off the last of the Longfellow Bridge's iconic shakers today when they re-attached the top, or capstone, of the tower closest to the Museum of Science on the Boston side. Read more. 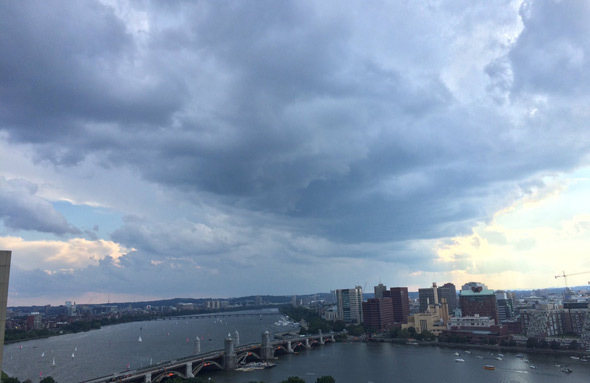 John Gage kept his eye to the sky shortly before 6 p.m. today.